What's in the large console you use on stage? It looks very complex. "Well, actually it's not all that complex. It's a little rough to maintain. Things can get broken where it's shipped around. It's got a pair of Dynaflangers, a pair of MXR Flangers. It's got one input and four outputs – two dirty outputs and two clean outputs, all stereo. There's also two Big Muffs, Systec Harmonic Energizer – all these things are in pairs – Oberheim ECF, Eventide Harmonizer, MXR DBL, Mutron, DBX 162 compressors, Gain Brains, Kepexes, a Theremin and a Biphase. That's about it, and there's about 24 switches on the floor. I add to it every year. The Dynaflangers are on the newest thing. Oh yes, there's a Mutron Octivider and a DBX Boom Box. " 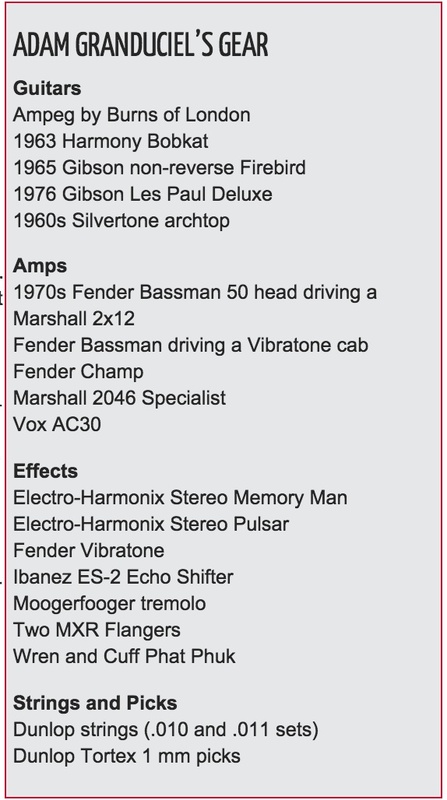 - From the Guitar Player Magazine in 1979 (May-June), written down in the Zappa Wiki "Wiki Jawaka"
"By popular demand… My pedal board! Designed by the illustrious Sean Cox!" "Anthony uses a small selection of pedals: an MXR Stereo Chorus, MXR Flanger, and MXR Bass Octave Deluxe, powered by a DC Brick Multi Power Supply. He also uses a Boss TU-1000 tuner (not pictured)." In this video, at 0:16, an MXR Flanger pedal can be seen on Ed's pedalboard. "MXR flanger made famous by EVH." In [this interview](http://www.premierguitar.com/articles/20889-the-war-on-drugs-driving-music-for-the-american-dreamscape?page=2) with Premier Guitar, the MXR Flanger Guitar Effects Pedal is listed as part of Adam Granduciel's effects. This [article](http://www.geocities.ws/jendave/art_musician_rude_boys.html) states that Mick used "a brace of" MXR effects from 1980 onwards, including the MXR Flanger. Can be heard on 'Charlie Don't Surf' (1980). During an interview w/ Premier Guitar for their Rig Rundown series an MXR Flanger can be seen [@ 11:10] on Kerry Kings pedal board. Tim uses an MXR Flanger, according to [this](http://www.guitargeek.com/tim-mahoney-311-guitar-rig-and-gear-setup-2009/) rig diagram by Guitar Geek. John talks about his MXR pedals in this November 1986 issue of *Guitarist* Magazine. "All the effects are MXR except the Overdrive. I use an MXR rack compressor/limiter which isn't here at the moment. It's so good that our sound guy knicked it and put it on the PA and I haven't got it back yet! Two Flangers, so I can have them at two different settings..."
From 3:18 to 3:26 the MXR Flanger Guitar Effects Pedal can be seen in the foreground on a mic stand. 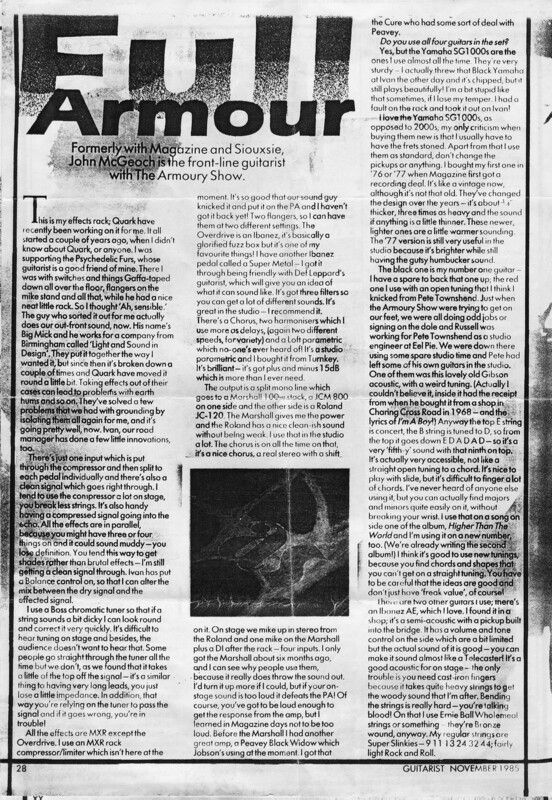 It's the setup Smith inherited from McGeoch when assuming his place in Siouxsie and the Banshees per [this *Guitar World* article](http://www.thecure.cz/resources/PRESS/USA/19960600.guitarworld.us-052.jpeg). Robert says in this article "It was a lot more interesting the second time I played with the Banshees and inherited John McGeoch's setup. (McGeoch has also played with Magazine, Visage and P.I.L.) He had an old MXR Flanger mounted on a mike stand." "Typically, I play straight with a touch of delay, but I sometimes use an MXR Flanger"
For more movement in the sound, Hammer used a slight bit of flanging, coming from an MXR black-face pedal (now reissued by Dunlop). The final effect that Kaoru uses is a flanger by MXR. Taken from the Dir En Grey website. 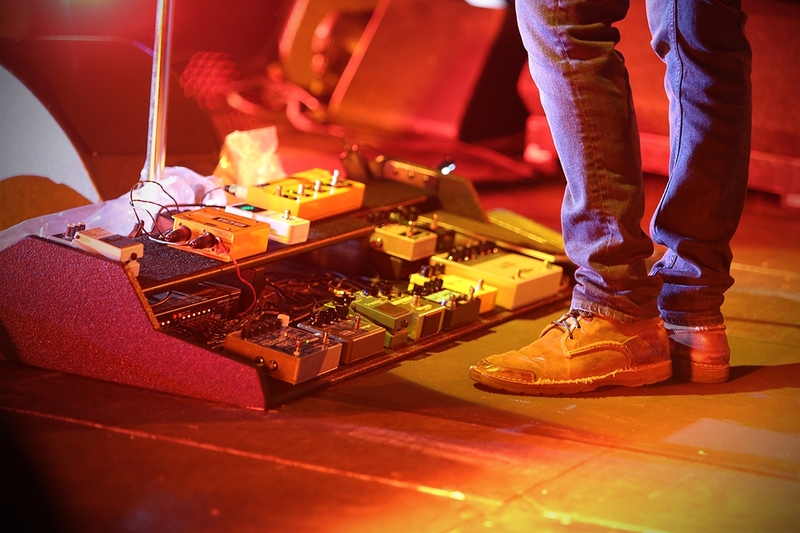 This article giving details of Adamson's pedalboard states that he used this effect. At 5:46 the MXR Flanger is shown. Featured in this Instagram post by Larson. Go with a vintage if you can find one cheap, but if you can't, this can do almost anything the old ones can. Otherwise, it was a good purchase, and MXR pedals are amazing. The best flanger I've ever owned, plain and simple. Best flanger out there no arguments. Let reach the minimum words.